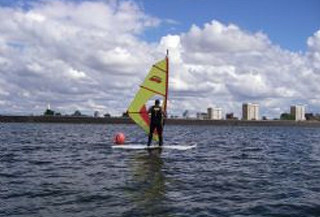 Here is our listing of windsurfing in various locations all over the UK. Compare the prices, check the availability and choose the one that is convenient to you.Windsurfing is an exciting activity that is hard to miss out on your day out. We specialise in party planning for groups and can help you organise your day out well before time. Wind-riding addicts can beat the winds and caress the strong waves for an exciting spell of wind surfing. Break free from the mundane and typical party activities and do something really exciting and extreme in the form of windsurfing. A sum total of skill and endurance, surfing will literally make your heart miss a beat or two. Balance the surfboards and steer clear of big waves using wind power, surfing is all about smart and subtle moves. In case you need any fresh party planning tips or additional information on windsurfing lessons, just give us a call and make sure that your day out turns out to be something special.